I had submitted my video for the Future Imperfect conference at Plymouth University and I was just notified that is has been selected to be shown there in the cinema at the symposium and I have been invited to speak about my work and to contextualize the video. In the past two weeks I wrote a 13 page transcript of the interview I had done with Holocaust survivor Fred Terna in Brooklyn on my last day in New York. The visit with Fred was very inspiring and the time we spent on that sunny cold afternoon in his house in Brooklyn was just wonderful. Raul Barcelona had kindly offered to do the filming of the interview since I did not have any filming equipment with me in New York. Fred is a painter (!) and he kindly showed us all his work. He paints fire!! His work (which we also saw in an exhibition in Brooklyn before we met Fred) is fantastic. We spent a wonderful time and it was really great to meet and get to know Fred, what a very interesting man. I selected three excerpts that I will be putting together as one video for my installation of my first year project (together with the 3 other videos which I will create out of my Black Milk of Daybreak Video). The lessons that I have learned, during the war and of – since the war is, what counts - to live in a sensible, fair and open community where we are all responsible for each other. Be involved. That is what I would tell them. I am not telling them how to do what. But you cannot just stand back and say, it’s them. I have nothing to do with it. In a sense, saying, this is what is accused of Central Europeans, Germans, Austrians, they weren’t involved. So, that is the message I would try to convey to them. And say, is this paid for? It is difficult. It means a lot of introspection. And learning. 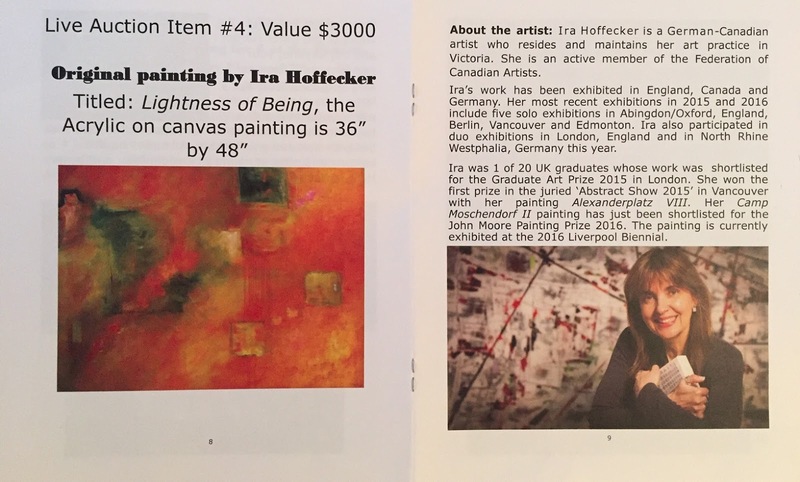 I was asked by the Federation of Canadian Artists art magazine ART AVENUE if I could please write an article about my current paintings, so I wrote the following essay: (which they edited and shortened a little bit, but it will now look like this now): I also mentioned Transart Institute! I was born in Germany, and my work talks about the experiences of those living there, and the different identities that locations in that country take on over a period of time. Maps, therefore, have been a prominent influence. With the four new paintings shown here, I have started to move away from my usual method of overlaying two or more maps. And in addition to demonstrating how one place can have two different identities, I have become very interested in exploring the process of abstract painting. Therefore, my compositions are looser, which offers an element of ambiguity. I am attempting to add either “structure to the chaos” or “chaos to the order” of the maps and new structural elements that are used. I had begun these painting with several layers of paint and a map as I usually do, but now, instead of overlaying only the map, I include a structure such as a building. The building image unfolding here depicts the factory that now stands where the forced labour camp, Lager Moschendorf, once was. During WWII, the camp was located in the Moschendorf district of the town of Hof (Saale), which is the subject matter in my recent work. The viewer can still recognize the original map underneath, but there is an additional element in the work. Before, my concern was merely about the meaning of the work. But now this new series of large paintings are also about the process of painting, the rules and elements of abstraction, and about composition, eye movement and colour. My work has always been informed by the urban environment; I have always been interested in how different societies transform and change city spaces over the course of centuries. My work examines the relationships between people and cities that respond to constant change, reconstruction and restoration within the urban landscape. More recently, however, I have wanted to examine our German past — both personally remembering and collective memory. I want to work against forgetting and against suppressing the memory of the past. For example, in a recent photographic series about genocide, I asked, “What would I have done if I had lived under the National Socialist regime?” I feel that this is still a relevant theme of our time, and it is important to remember to “stand up and speak up,” and not simply be a bystander. Other exciting changes are occurring within my art work. I recently began working on my Master of Fine Art degree at the Transart Institute accredited through Plymouth University, England. And in addition to painting, I am working with video, photography and sound. For my written work, I am researching contemporary artists who investigated identity after WWII and after the wall came down in 1989: Christian Boltanski, Susan Hiller and Shimon Attie. Ira Hoffecker, AFC, has had recent solo exhibitions in Oxford, England, Berlin and Hof, Germany, Vancouver and Edmonton. Ira was one of 20 UK graduates whose work was shortlisted for the Graduate Art Prize 2015 in London. She won first prize in the “Abstract Show 2015” in Vancouver with her painting Alexanderplatz VIII. Her Camp Moschendorf II painting has been shortlisted for the John Moore Painting Prize 2016, and has been exhibited at the 2016 Liverpool Biennial. Ira resides in Victoria. 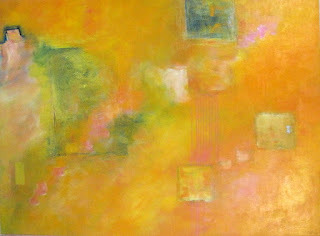 A couple of times a year I am donating a painting to raise money. I am proud to say that my painting Lightness of Being raised $3500 at the recent Vigsa MS Event here in Victoria. You can tell that the painting is not recent. I created it about 3 years ago. Yes, I am taking an 8 week break from the crit group, I am working extremely hard, but I also had to renovate studios and write the transcript of the interview with Fred and write my paper and felt I would not be a good member of the group if I cannot dedicate at least a day each to respond to other people's work, just missing the first round of feedbacks. I just want it to be fair to the others too. I still look at other peoples work and have given some individual feedback. Also I very much prefer to Skype with people than to write and write feedback, so I have skyped with Bill and Andrea last week, we are thinking about collaborations.